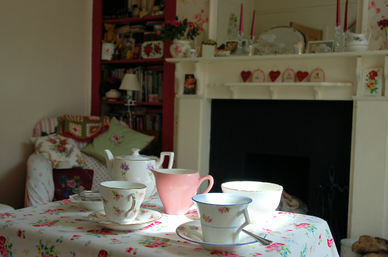 The scene was set for my friend Lisa to come over, at long last, for our 'crochet session'. This is something we've tried to organise for sometime and I was really looking forward to it. 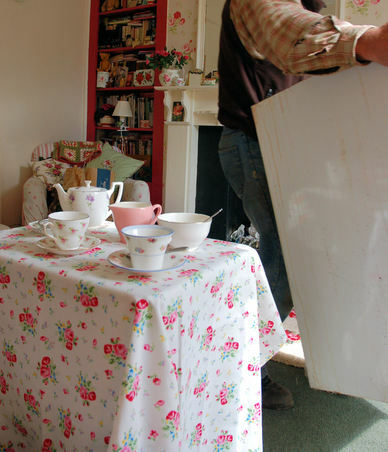 The children laughed, well scoffed would be more accurate, at me as I decided to set up a little tea table which looking at it now, looks barely worth it! Why didn't I go the whole hog and arrange it with a cake stand and a vase of flowers - it looks quite ridiculous and (horror of horrors)...dull..a word that strikes fear into my heart! It really does make me smile when I think back to Lucy's reaction when I asked her if she would, at some point in the afternoon, take a photo of the scenario for the blog....as she looked up at me from her studies, her face incredulous.."What do you want me to do? Are you joking? Take a photo of you two with the tea things in front of you? No, you are crazy!" So I took the photos myself but it wasn't long before our quiet, girlie afternoon was interrupted - just as I had made the tea. Did I tell you weeks ago that our fridge had broken? Well, Anth had arranged for our friendly 'odd-job' man to come and remove the old fridge freezer before the new one (which has just arrived today) could be installed. So, there was banging, sighing, requests for screwdrivers, light switches having to be removed, the very loud whizzing of an electric saw, (tiny kitchen = tiny space = cutting off a cm of work top = every little helps!) sawdust flying everywhere and cats running around covered in cobwebs as they found a way behind the kitchen cupboards due to the removal of the fridge/freezer. Lisa and I sat with all this commotion going on but dissolved into giggles when every now and then a now separated fridge or freezer would pass by! 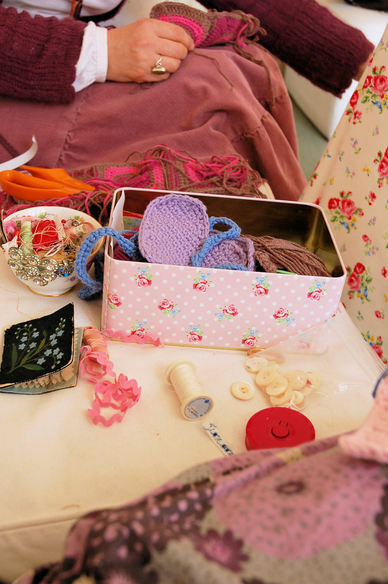 Now that wasn't the afternoon I had been expecting but did we manage to do much crochet? Well let's say that a repeat of the afternoon is necessary minus household appliances passing before our eyes!